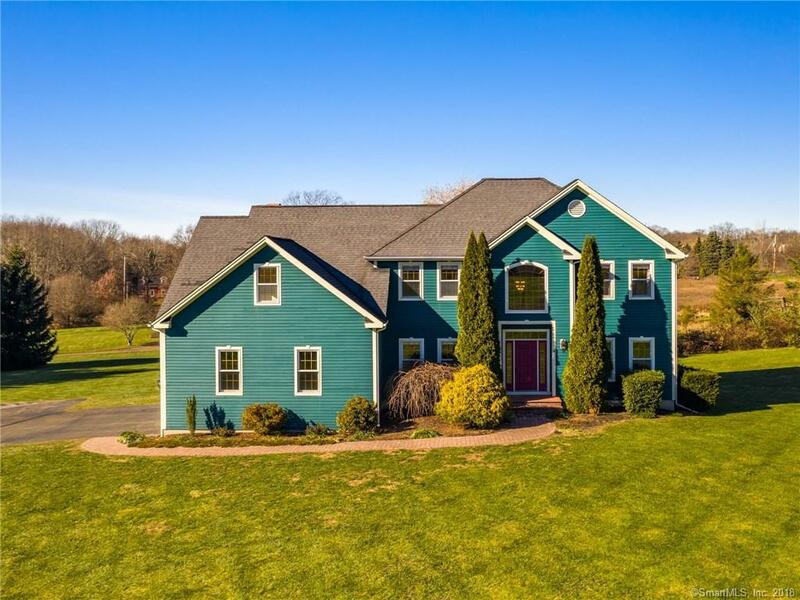 Absolutely stunning colonial set on 1.85 acres on a culdesac with LEVEL yard. This 4 bedroom Colonial features a grand entry with a two story foyer, open balcony. Spacious kitchen includes granite counter tops, center island and an eat in area with sliders to the Gazebo on the deck. The kitchens opens to a beautiful two story family room with a beautiful fireplace. Main floor office, formal living room and laundry room, Master bedroom suite has large walk in closet and a spacious master bath with double sink vanity, corner jetted tub and separate shower. Three more generous sized bedrooms, 2 1/2 bathrooms. Huge unfinished basement offers plenty of room for a workshop and storage, the partially finished space is ready for all your hobbies even an art room. 220/30 amp service in basement and in the over-sized garage. Enjoy nature with Tyler Mill Preserve and hiking trails, close to Golf course, highways and town! Gorgeous curb appeal, newly updated move in ready home is an absolute must see! !